The first step is that you must define what you mean by “balance”. For most wire HF antennas, the balance objective should be equal but opposite currents in the adjacent wires at all locations along the line (recalling the currents may vary along the line). This reduces radiation from the feed line (which can cause EMC problems with nearby appliances / systems), and reduces very local noise pickup on receive (from those same appliances / systems). Let’s take KA0KA’s scope display from the reference article, but assume that they were taken from current probes so that we are directly measuring feed line currents rather than voltage. Current probes allow the scope to measure current on a conductor placed through the probe, an RF current probe (or current transformer) can be as simple as a suitable ferrite toroid with the primary conductor passing once through the center of the core, and a secondary winding of 10-30 turns loaded with a low value resistor, and the scope input connected across the resistor. Above, the first measurement shows both channels, and the currents appear almost equal in magnitude and almost opposite in phase, but it does appear that there is a slight phase difference, perhaps 5-15° from exactly opposite phase. Each channel is almost 2div peak to peak, and let’s assume the calibration factor is 1A/div. At this point, it would be easy to consider that the currents are equal but opposite. Let us explore the limit scenarios of 5 and 15° phase difference. Lets solve for ic and id (common mode and differential components) using Python which handles complex numbers. i2 is converted from polar form (where the phase is calculated in radians) to rectangular form, the ‘normal’ form for complex numbers in Python. So, id has a magnitude of 0.949A and ic has a magnitude of 0.0414A. 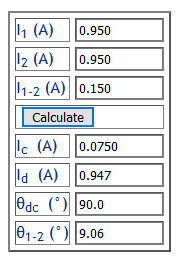 So, id has a magnitude of 0.942A and ic has a magnitude of 0.124A. Under this scenario, the value of ic is very sensitive to the phase difference and it is quite difficult to read it with great accuracy. You could use calibrated cursors in a modern DSO to improve the accuracy, but it is fiddly. Calculated Ic is also very sensitive to the magnitudes of i1 and i2. All in all, this is not a very good measurement setup for the scenario at hand. Measuring the difference current more directly. Exploiting the facility in most modern scopes to add or subtract two channels, the following second measurement is of the difference of the channels. 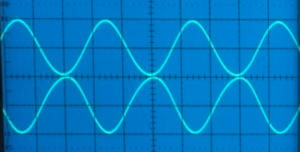 There is some unexpected offset there, but importantly the magnitude of the RF component is about 0.3div peak to peak. The solution for magnitude of ic then is simply 0.3/2/2=0.075, it has been measured directly. We could go on and solve for Ic and Id (common mode and differential components) given i1, i2 and i1-i2 using the law of cosines, again using Python. For convenience, there is also a handy online calculator which solves the problem using the law of cosines. Above are the results, ic is 0.075A. The other results remain quite sensitive to measurement of i1 and i2, but since the desired quantity is ic and we have measured it fairly directly, confidence in the value obtained is good. A simpler measurement is where measurement is made of the current in each wire and then both wires using a single clip on current probe. In the case where both wires are passed through a single current probe, the current in the secondary winding is proportional to the algebraic sum of the wire currents (ie having regard for phase), so the difference current is obtained directly. The use of a single current probe eliminates some uncertainty in the measurements. Measurement of each of the currents i1 and i2, and i1-i2 allows calculation of the magnitude of ic and id and the magnitude of their phase differences (as demonstrated above). The astute reader will have realised that a scope is not needed for this measurement, terminating the current probe transformer in a resistance and measuring the voltage with a simple detector can provide the needed data. Such an instrument is described at Measuring common mode current. 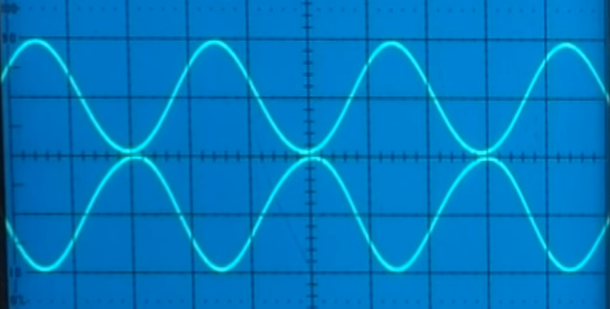 Whilst it might be held that an oscilloscope is the universal measurement tool, that it can do anything, it is doubtful that it is very suited to measurement of feed line common mode current, and a much simpler instrument designed as a clip on RF current meter is much more convenient, and direct reading.